If you’re into cycling, Aspen is the place to be. 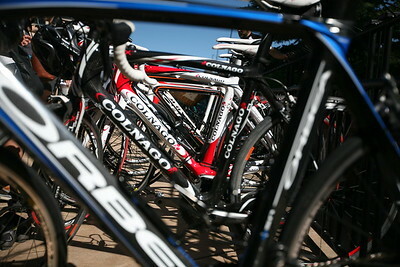 We were under the care of the Little Nell Adventure Center in Aspen and they outfitted our merry band of bicyclists with top of the line Orbea and Colnago carbon frame bikes which were nothing but a pleasure to ride. Pro rider Scott Kasin led us up the 10 mile 4-5% grade climb. Remember that Aspen, where we started already sits at 7,900 feet and we climbed nearly 1,600 feet to 9,500 feet. Just short of the top, I passed a guy and asked him how he was doing and his reply was “Just trying to keep up with Lance!” I chuckled and replied “Aren’t we all!” Thinking he was speaking in cycling generalities. But low and behold, I pulled up to Scott chatting with a group of cyclists in the shade, and one of them was wearing a black jersey with a yellow LIVESTRONG stripe across his chest.